Vitally, our campaign activities focus on decision makers and inspiring, educating and engaging them, so that they can take informed action. Understandably, as for individual’s involvement with the campaign, this is not everyone’s cup of tea and neither is it all that we do. If political campaigning and lobbying is your thing, consider joining the Committee. If it isn’t, fret not – there’s still loads that needs doing – some of it is of a technical nature (website, cycle infrastructure design), some organisational (running a community interest group). Moreover, people who write articles and help to keep the website narrative and archive alive, would be very extremely handy too. Our website is an important tool. As we pledge to be transparent and open in what we do, the website really is our official archive telling the Campaign’s story, as well as talking about our future wishes, plans and demands. Also in Communications, this small group publishes the monthly newsletter (using mailchimp). We are looking for someone who could gather the articles together for the newsletter. The mailchimp conversion and emailing-out is then expertly carried out by Tim. There’s the technical Infrastructure team and we will talk to you about it soon. We are also looking to set up Data and evidence (Secretary) and Finance (Treasurer) teams. 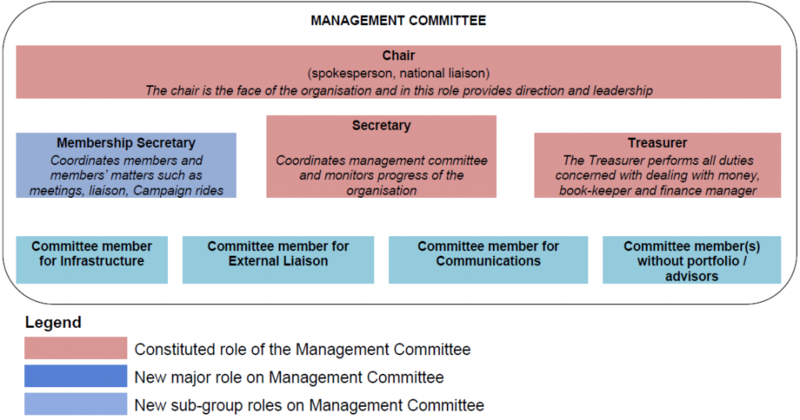 Of course, the Committee is at hand to steer and guide members and teams, bringing the organisation nicely together as a whole.